We are now less than a week away from almost all pitchers and catchers reporting, and the two biggest free agents on the market — Manny Machado and Bryce Harper — have yet to sign. The rumor mill around them continues to swirl, but we’re tired of not knowing for sure where these two will play this year. So we thought we’d take matters into our own hands, instead of simply waiting around for the latest hot-stove updates. To that end, we called on our friends at Out of the Park Baseball (OOTP), a strategic simulation game that allows players to put on their general manager hats and run their own teams. We asked them to simulate out the careers of Harper and Machado a bunch of times under scenarios where they sign with a bunch of different teams. Think of it as the multiverse of MLB possibilities that still could play out, depending on where these two superstars end up signing. … Machado signs with the White Sox? Machado is one of the brightest stars in the OOTP universe, with an overall rating of 77 out of 80 (using the traditional 20-80 scouting scale). If he were to sign with the White Sox, one of his most frequently rumored suitors in real life, OOTP sees him having a tremendous individual debut in Chicago, putting together an All-Star season worth 6.5 wins above replacement. But the White Sox would have to wait until 2020 to improve as a team, leaping from 63 wins in 2019 to 92 in 2020, with Machado once again having a strong 5.8-WAR season. Chicago would average 92 wins per season in 2020 and ’21, making the playoffs both years, but they would top out with a tough five-game loss in the American League Division Series in 2021, then drop down to 80 wins in 2022 as Machado’s teammates regress. He would average 5.7 WAR per season over the next two years, but the Sox would miss the playoffs both seasons, with Machado opting out of his contract to join the New York Mets on a five-year, $197.5 million deal before the 2025 season. (Chicago would be fine without him, making the American League Championship Series in 2025 and 2026.) 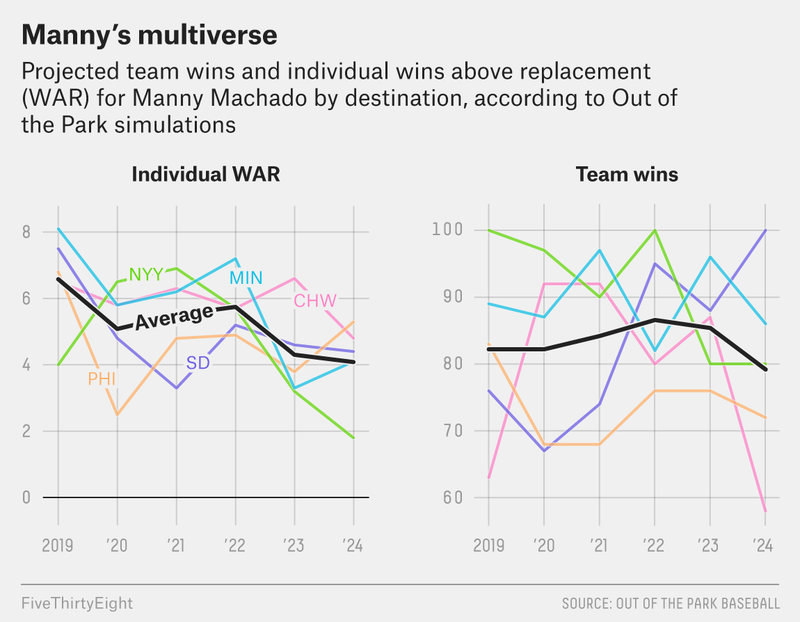 In New York, Machado’s individual numbers would decline to an average of 4.1 WAR per season, but he would help the 2028 Mets reach the World Series — where, in classic Mets fashion, they would lose to the Astros in seven games. After bouncing to the Nationals and Rockies in the early 2030s, Machado would retire in October 2032 with a JAWS score of 63.4, which should easily earn him a place in the Hall of Fame. … Machado signs with the Padres? If Machado were to sign with San Diego, OOTP’s AI thinks that he would make about $14 million more over an eight-year contract than he would with the White Sox. But how would his Padres do on the field? In this universe, Machado would have an incredible initial campaign in Southern California, putting up 7.5 WAR and winning the National League’s MVP in 2019. His team, though, would only improve from 66 to 76 wins, good for third place in the NL West, and Machado would later struggle to repeat his amazing debut season. The simulations have him averaging just 4.1 WAR per season in 2020-21, with the Padres winning only 71 games a year. But in 2022, Machado would bounce back with 5.2 WAR, and San Diego would win 95 games, making the divisional series. It’s part of a three-year playoff surge for the Padres, peaking with 100 wins in 2024 — but that team is projected to crash out of the playoffs with a disappointing five-game NLCS loss to the Dodgers. That offseason, Machado would opt out of his initial contract and sign a five-year, $157.5 million deal with the expansion Memphis Scouts — which are a thing in this universe! — where he would spend the next five seasons playing reasonably well (4.2 WAR per year), but losing so many ballgames would surely give him flashbacks to the horrid 2018 Orioles. The best season of Machado’s final years is forecast to be an out-of-nowhere 4.3-WAR season with the 101-win Cincinnati Reds in 2032, but that team would ultimately lose in the divisional series. In September 2035, Machado would retire from pro baseball as a probable Hall of Famer. … Machado signs somewhere else? While OOTP’s AI thinks Chicago and San Diego are the destinations most likely for Machado, it also forced him onto the Phillies, Yankees and Twins for the sake of the full multiverse. The first two outcomes are about a wash individually, with Machado nearing 7 WAR in his best simulated season for each team and producing roughly the same total WAR (33.9 in New York, 32.6 in Philly). He would also stay longer in each city: seven years with the Phillies before opting out to join the Giants and the full eight-year contract span with the Yankees. But in terms of team performance, Machado wouldn’t win a World Series in either Philadelphia or New York, coming closest with a seven-game ALCS loss in 2022 as part of his Yankees timeline. It’s kind of a sad set of outcomes for a pair of teams that you’d think would offer Machado the greatest chance of team success. As for the Twins, they would be very successful with Machado, winning 90.2 games per season in his five years in Minnesota, including a World Series berth in 2021. But he would also opt out of that contract as early as possible, moving on to sign a massive deal with the Giants. Such is the way of Minnesota sports. … Harper signs with the Giants? The Giants are a weird team that won 73 games last season despite trying to contend, and they do have the need for a corner outfielder like Harper if they want to try it again in 2019. According to OOTP, San Francisco would pay about $15 million to $20 million more over a seven-year deal than Harper’s other potential suitors, and they wouldn’t get much postseason success out of it. They are projected to average 85.5 wins per season over the first four years of Harper’s deal, finishing second in the NL West (and out of the playoffs) each year. They would also get classic inconsistent Bryce: 5.7 WAR in Year 1, followed by 2.2 and 2.9 WAR (both seasons riddled with injuries), then 4.4, and then 0.6 in a terrible 2023 season during which Harper would hit .209, with the Giants crashing to 74 wins. After six up-and-down seasons by the Bay, Harper would sign a four-year, $116.8 million deal with the Brewers. He is projected for a strong season on a playoff-bound Milwaukee team in 2025 but then just 2.1 WAR per year over the next two seasons before opting out early yet again to join … yes, the Yankees. During his inevitable run in pinstripes, Harper would boast an .821 OPS as his Yanks make (and lose) the ALCS in 2028, but he would put up negative WAR over the next two seasons. He would retire at age 38 after being released by New York (and briefly rejoining the Giants). Harper’s final JAWS score of 49.9 would put him right on the edge of the Hall of Fame relative to other right fielders. … Harper signs with the Cardinals? This is one of the most successful universes either star free agent had in our OOTP simulations. In this world, the Cardinals would grab Harper for the bargain-bin price of $151 million, and he would stay with them for a total of 12 seasons thanks to another midcareer contract extension. St. Louis would be mostly competitive throughout Harper’s dozen seasons there, averaging 87 wins per year and making the playoffs nine times, including two pennant-winning runs. Harper is projected for 53.4 total WAR in a Cardinals uniform (which would actually rank him just below Ozzie Smith for fifth on the franchise’s all-time leaderboard), winning the 2023 NL MVP with a 1.033 OPS and 7.4 WAR. In Harper’s final season as a Cardinal at age 37, OOTP sees St. Louis losing the 2030 World Series to (Machado’s?) White Sox in a heartbreaking seventh game. After leaving St. Louis, Harper would sign a three-year, $62 million deal with the Mets, but a fractured knee would cost him 88 games in his first New York season, and he wouldn’t be the same player afterward, averaging just 1.1 WAR/year in 2032-33. Following an ineffective 51-game stint with the Giants in 2034, Harper would retire as a surefire Hall of Famer with a JAWS score of 69.2. … Harper signs somewhere else? Harper has been linked to so many teams, it’s tough to keep track sometimes. So we asked OOTP to look at the other teams its own AI saw Harper signing with (the Padres and Dodgers), plus the Phillies, White Sox and Harper’s erstwhile team, the Nationals. Of those, the Dodgers easily offer the greatest amount of team glory — in fact, they would basically become a dynasty with Bryce on board, winning the 2020, 2021, 2023 and 2024 World Series and losing it in 2025 (as Harper would put up 44.3 WAR during seven seasons in L.A.).3 Individually, Harper would finish with 98.3 WAR in that universe, edging out his 93.2 WAR in the Cardinals simulation for the best of the options we looked at. 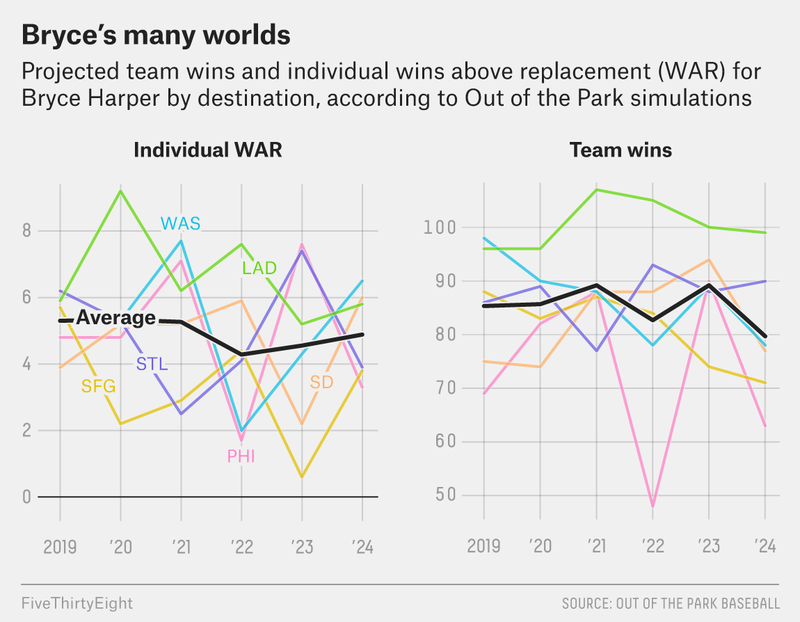 The rest offer varying degrees of lesser success from both a team and personal perspective, with the Phillies, Nats and Padres projected to make the playoffs a few times on Harper’s first contract (he would re-up with the Padres and Nationals for the long-term in those simulations) and Harper accumulating just shy of 80 career WAR in each universe. So where should each star sign? If these OOTP simulations are any indication, it looks like Harper and the Cardinals would be best off with him playing right field in St. Louis, and Machado should lean toward manning the hot corner for the Padres. But those are but two options in the multiverse of possible outcomes. The only thing that we are 100 percent certain about is that at least one of these teams should sign these guys now. Stars like Machado and Harper shouldn’t still be going into spring training without a deal in place — for their own sake and for the sake of fan bases whose teams can use them to compete this season. Special thanks to Richard Grisham and Out of the Park Developments for their help with this story. Though it can be a pretty serious simulation, as far as these things go. Perhaps you’ve heard of the soccer sim Football Manager and its notoriously addictive qualities? OOTP is essentially the same game, except for baseball. OOTP ran 25 sample offseasons for us, tracking how often each player signed with which team. Just for good measure, Harper would return to Washington in this Dodgers simulation, after a four-season stint with the Mariners, and would also win the 2030 World Series with the Nats in his age-37 season.